Provides support for an underlying protocol. A protocol factory provides support for an underlying protocol and owns Channel objects. It can process a subsection of face_system config section and create channels and multicast faces accordingly. Definition at line 59 of file protocol-factory.hpp. Definition at line 62 of file protocol-factory.hpp. Definition at line 62 of file protocol-factory.cpp. Register a protocol factory type. Definition at line 70 of file protocol-factory.hpp. Create a protocol factory instance. Definition at line 42 of file protocol-factory.cpp. Get all registered protocol factory ids. Definition at line 54 of file protocol-factory.cpp. Get id for this protocol factory. face_system.factory-id config section is processed by the protocol factory. Get FaceUri schemes accepted by this protocol factory. Definition at line 115 of file protocol-factory.hpp. Process face_system subsection that corresponds to this protocol factory id. Definition at line 73 of file protocol-factory.cpp. Definition at line 86 of file protocol-factory.cpp. References ndn::FaceUri::canCanonize(), ndn::FaceUri::getScheme(), ndn::FaceUri::isCanonical(), nfd::face::ProtocolFactory::CreateFaceRequest::localUri, and nfd::face::ProtocolFactory::CreateFaceRequest::remoteUri. The caller must ensure there is no existing netdev-bound face with same remote FaceUri on the same local network interface. Definition at line 106 of file protocol-factory.cpp. Definition at line 121 of file protocol-factory.cpp. Definition at line 171 of file protocol-factory.hpp. FaceUri schemes provided by this protocol factory. Definition at line 238 of file protocol-factory.hpp. Definition at line 239 of file protocol-factory.hpp. NetworkMonitor for listing available network interfaces and monitoring their changes. ProtocolFactory subclass should check the NetworkMonitor has sufficient capabilities prior to usage. Definition at line 246 of file protocol-factory.hpp. 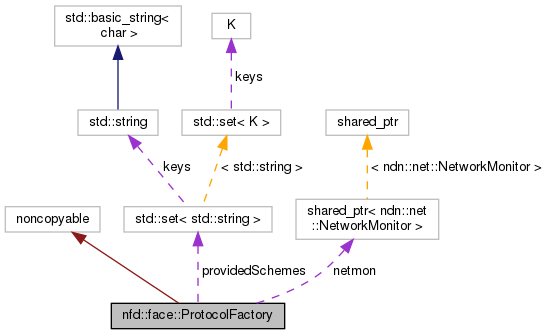 Referenced by nfd::face::EthernetFactory::EthernetFactory(), ProtocolFactory(), and nfd::face::UdpFactory::UdpFactory().